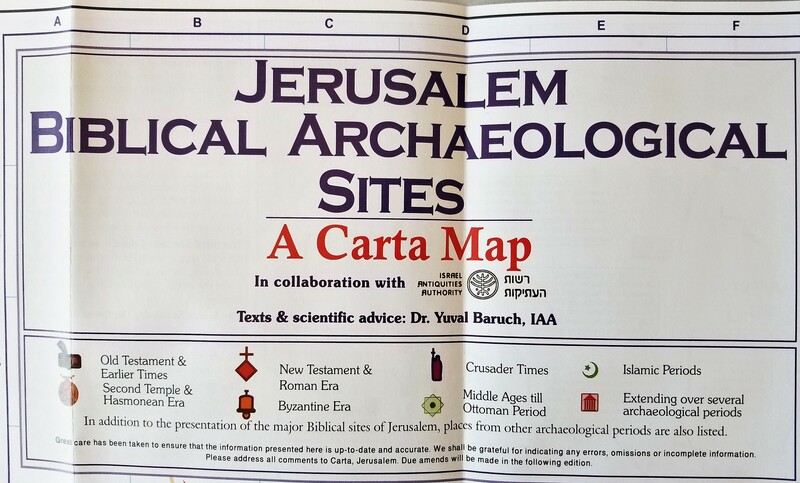 Soon after I became the liaison between Carta Jerusalem and Hendrickson Publishers (Hendrickson distributes Carta’s products in the US), I started hearing about an exciting new map of archaeological sites in Jerusalem they were working on: Jerusalem: Biblical Archaeology. 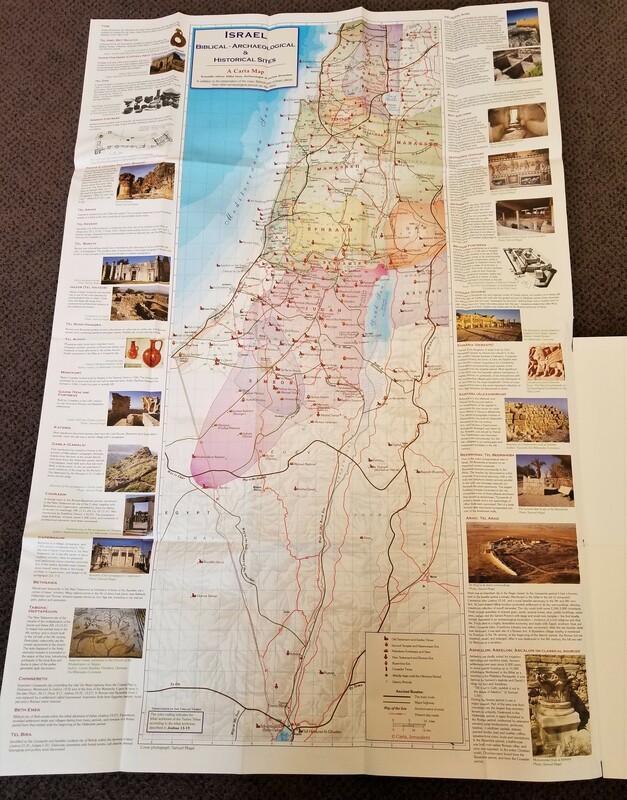 They said they were creating it in collaboration with the Israel Antiquities Authority, which is why it was taking so long to finish: new archaeological discoveries continued to be made, requiring them to update the map every time they thought they were ready to go to press! Now that I’ve seen the map, I can say it was worth the wait. This product is jam packed with archaeological information, but it is all presented in an accessible format that is easy on the eyes. 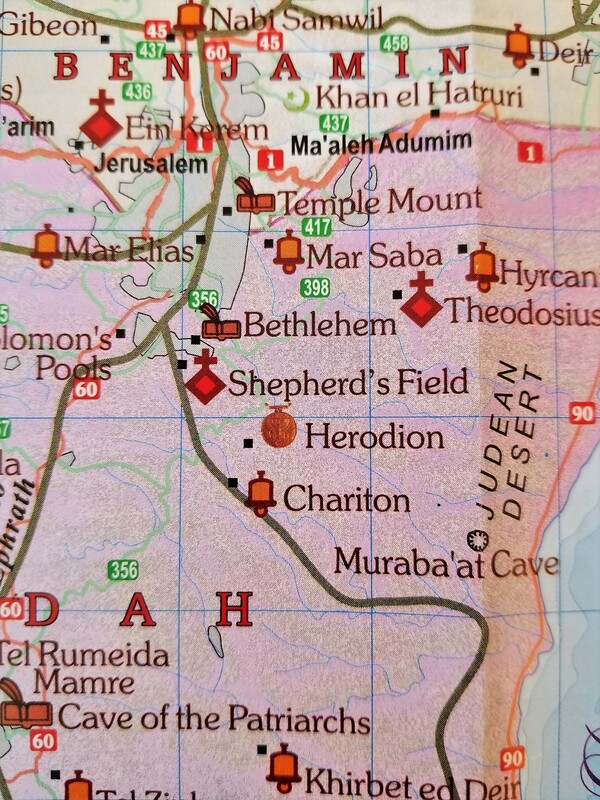 First of all, what areas does the Jerusalem: Biblical Archaeology map cover? 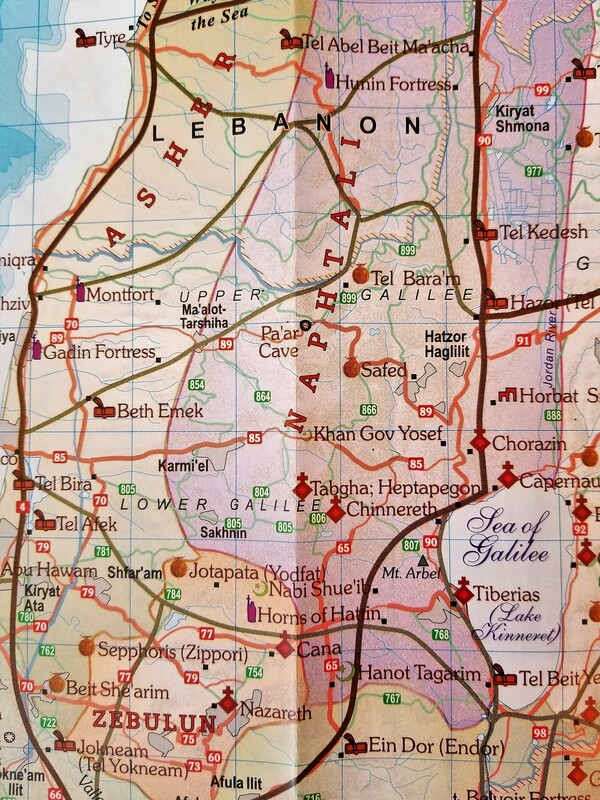 One side is taken up by a map that covers the greater Jerusalem area. Framing this map on two sides are large photos of many of the sites that are mentioned on the map itself. 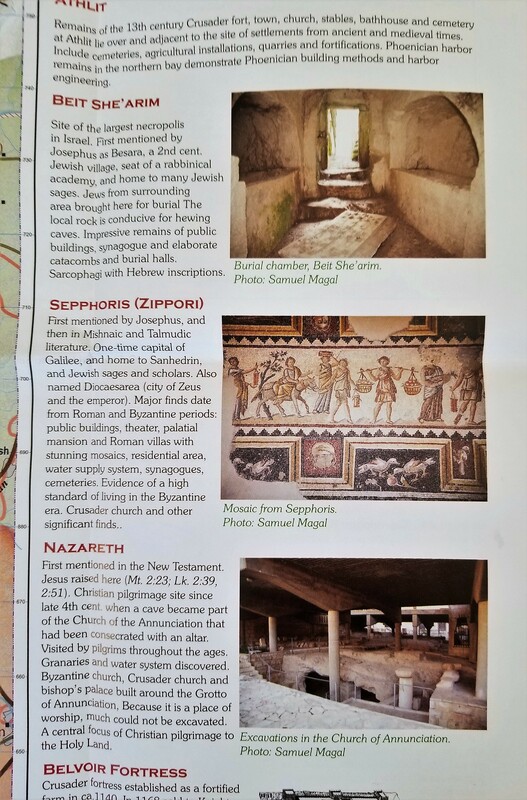 On the flip side is a large blow up of the Old City of Jerusalem that takes up one half of the space; the other half is devoted to more in-depth descriptions of important places within the Old City, such as Mount Zion, the City of David, the Kidron Valley, and the Water Aqueducts. 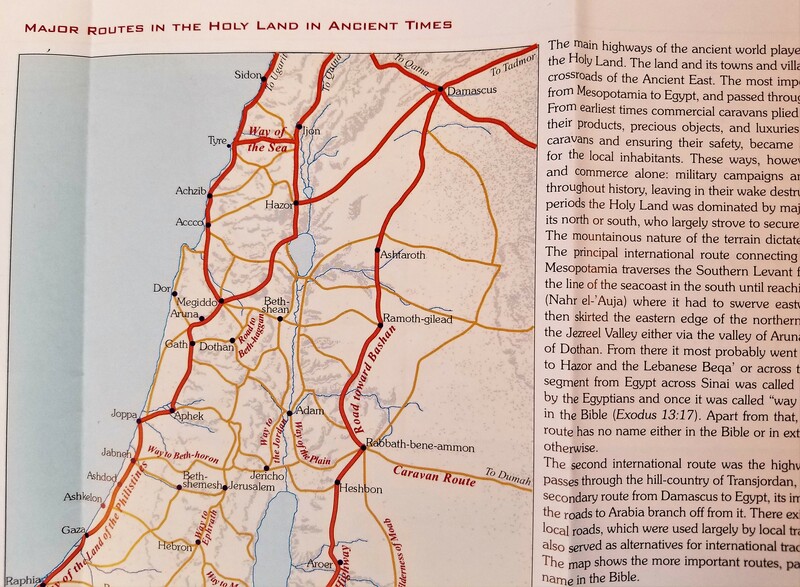 Photos of archaeological artifacts found in Jerusalem line two sides, and there is also a closeup of the route of the Via Dolorosa and explanations for all fourteen Stations of the Cross that are ranged along it. Click to see a high-res version of the image. 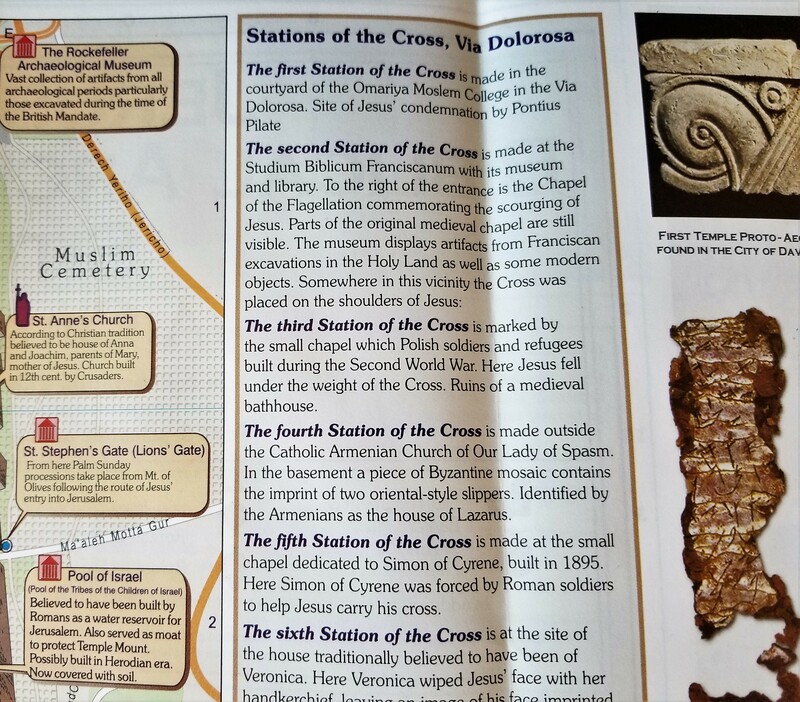 If you’re interested in only one or two time periods, this is helpful because you can quickly scan the map for those symbols to identify sites you would be interested in. It also really drives home just how much history there is in such a small area! 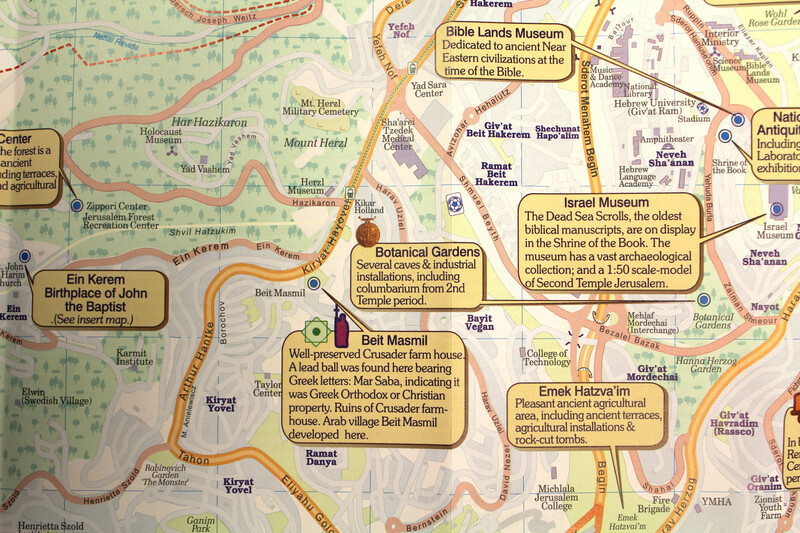 You can see here that museums are included among the listed sites, such as the Israel Museum, where the Dead Sea Scrolls are housed, as well as outdoor spaces, such as Emek Hatzva’im, where you can view ancient terraces and rock-cut tombs. Let’s flip the map over now to get a look at the Old City. 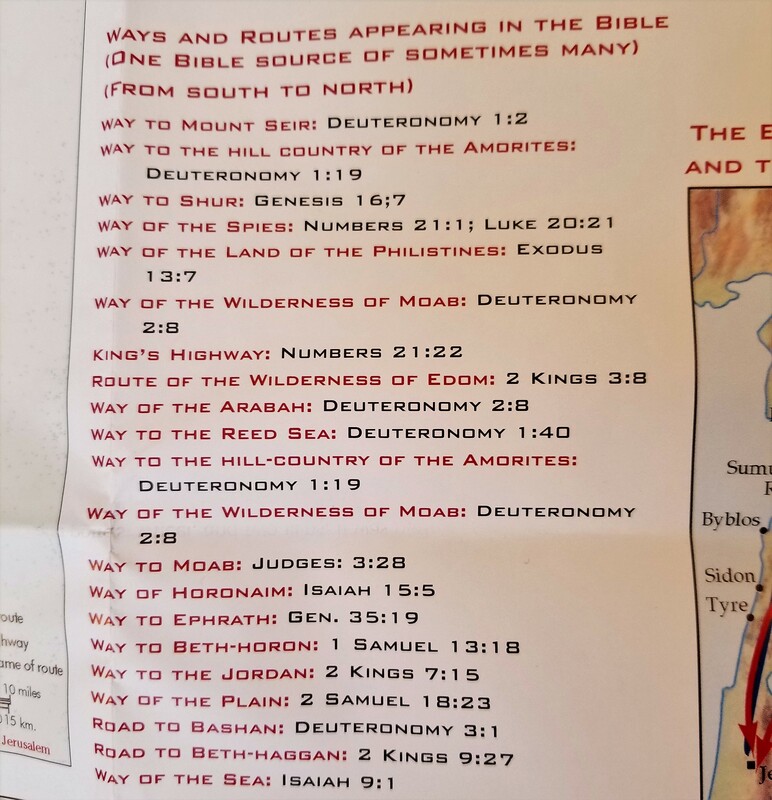 As I mentioned above, this side contains a closeup of the route of the Via Dolorosa (the route along which Jesus carried the cross on the way to his crucifixion, according to Christian tradition) and information on the fourteen stations of the cross that are along the route. 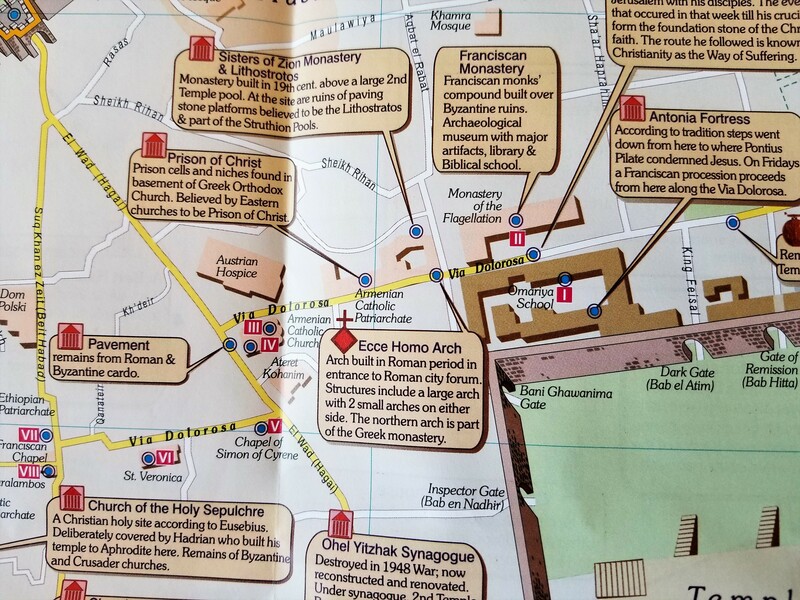 You can see that the Via Dolorosa begins just north of the Temple Mount and ends at the Church of the Holy Sepulchre, the traditional site of Christ’s crucifixion. 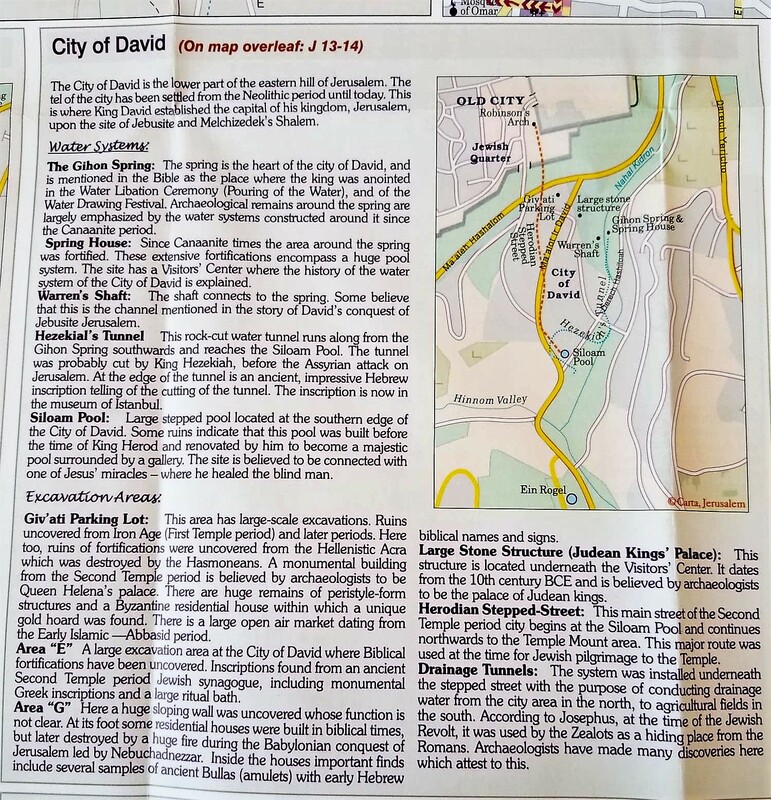 Here, Carta provides a detailed map of the City of David, along with descriptions and history for each individual element, and information on how to find it on the larger grid of Jerusalem on the other side of the map. As with everything on this map, the information is both easy to find and easy to read, since the font is quite large as far as maps go. 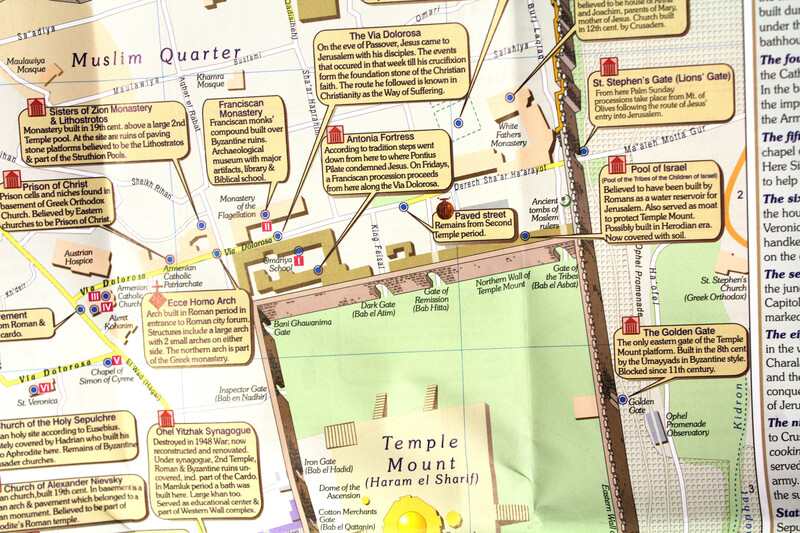 First of all, Jerusalem: Biblical Archaeology is great for anyone visiting Israel as a tourist. 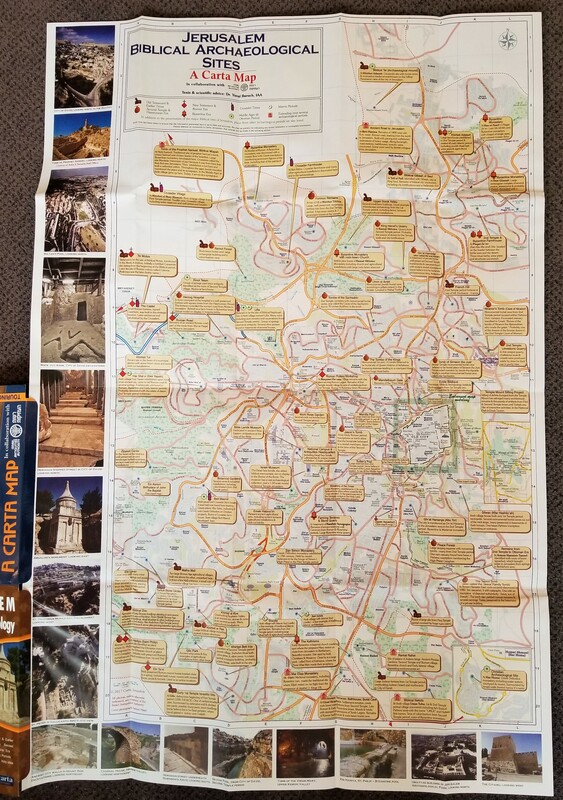 It is highly unlikely that any tour guide, no matter how knowledgeable, will be able to convey all of the information included on this map. In addition, if you want to stay after your tour and do some exploring on your own, this map allows you to do that in a knowledgeable way. 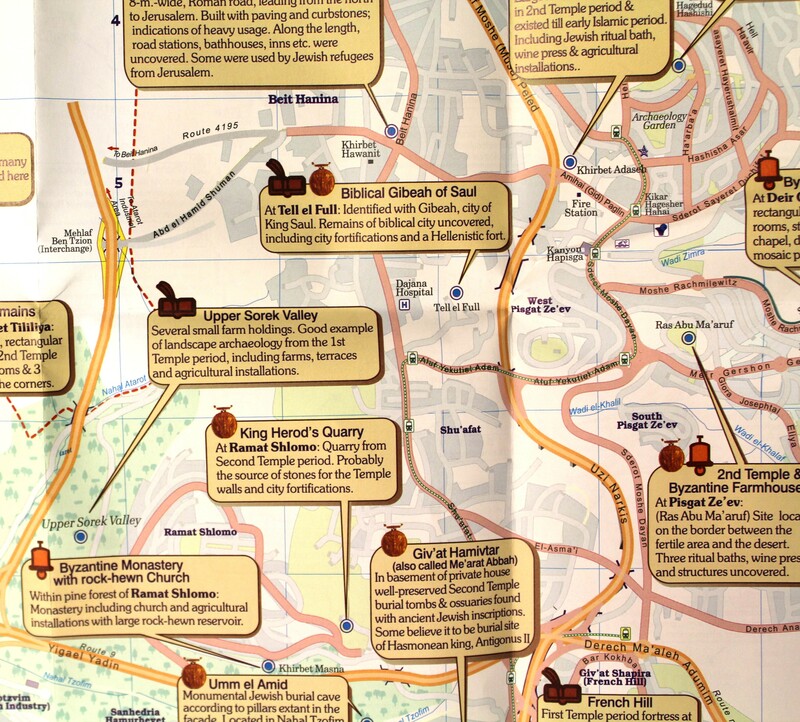 Or, if you’re not part of a tour group, this map can give you guidance as to where to go. Secondly, this map is an excellent resource for college students who are studying archaeology, history, or even Middle East politics. Thirdly, it’s a great resource for Sunday school classes (both for kids and adults) and Bible study groups, since it provides valuable historical context for the Bible—both Old and New Testaments—in a highly visual format. Fourth, it’s perfect for the “armchair tourist” who wants to learn more about Jerusalem, but doesn’t have any plans to travel to Israel. Fifth, it would make some pretty cool wall art in your office or dorm! 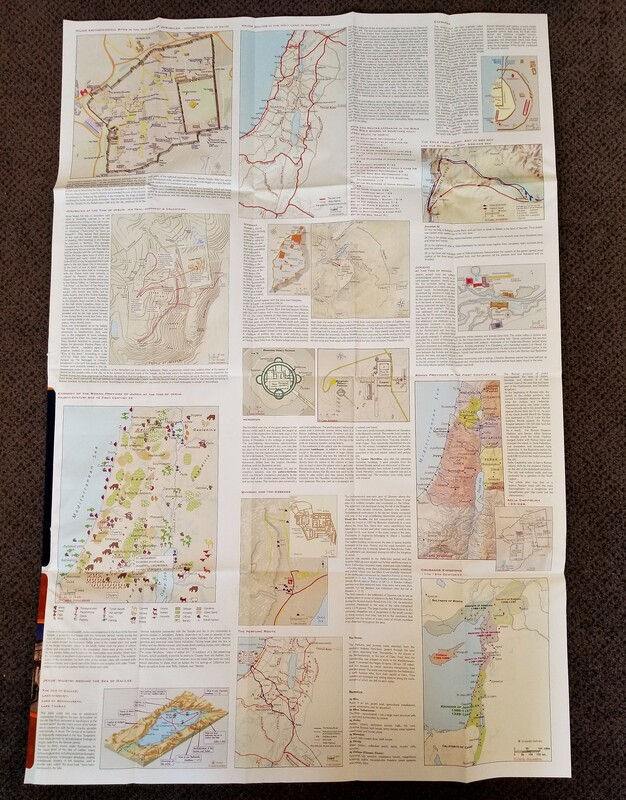 As I’m sure you can guess, the Israel: Biblical Archaeology map is different from the Jerusalem: Biblical Archaeology map in that it covers the whole land of Israel, not just Jerusalem. 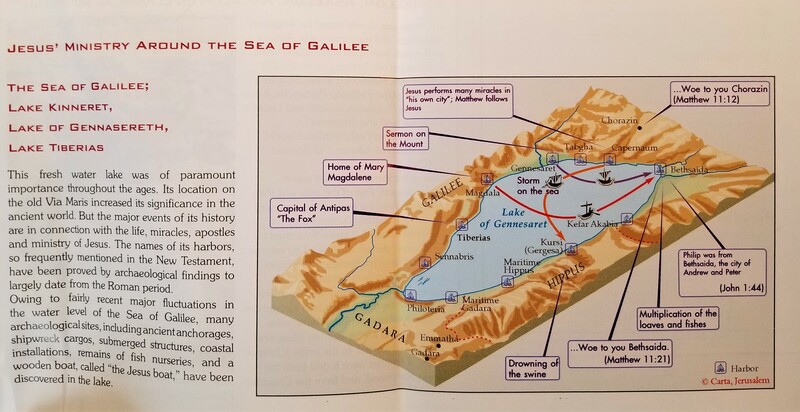 The section about Jesus’s ministry around the Sea of Galilee provides useful information, such as why the lake was in a strategically important location and how the names of the harbors mentioned in the New Testament have been confirmed by archaeological discoveries from Roman times. The wealth of information contained in both these maps is astounding, especially given how affordable they are (each retails for $14.95). The fonts are readable, the information is accessible, and the pictures and graphics are colorful and attractive. 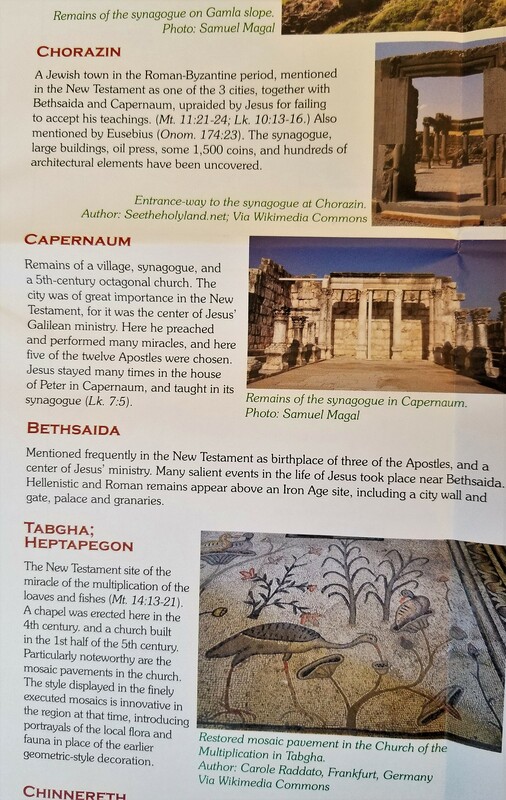 Both Jerusalem: Biblical Archaeology and Israel: Biblical Archaeology are must haves for anyone traveling to Israel, and they are excellent Sunday school and classroom resources as well. A huge thanks to Carta for producing such wonderful resources! 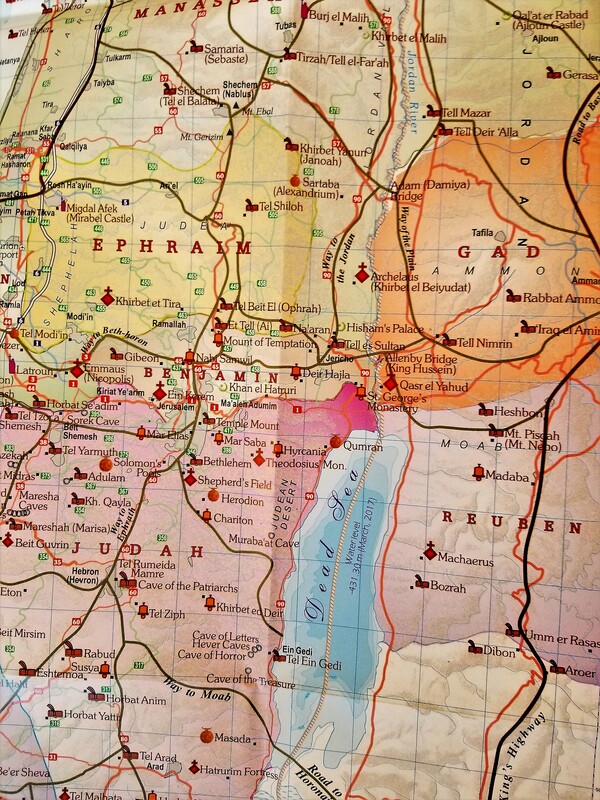 For more information about these two maps, visit our website or click the below images.